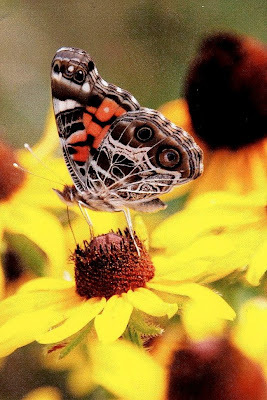 This beautiful butterfly, the American Painted Lady, actually flew into the picture. I had stopped to photograph the Black-eyed Susans and suddenly this beautiful butterfly appeared. Sometimes we just get lucky. This well traveled butterfly, the Monarch, although it will visit a variety of flowers most frequently visit milkweed upon which it lays its eggs. The Tiger Swallowtail is certainly widely recognized and familiar to almost anyone with a fllower garden. This is a Spicebush Swallowtail and frequently confused with the Black Swallowtail which is very similar.